Only a small post today. Since having the flu badly for a couple of weeks, I now have some kind of tummy bug. Eating makes me feel so very uncomfortable. Not fun. Anyhoo, this morning when I walked into the kitchen I looked out the window and for a moment, tried to remember if the neighbours usually had statues on the roof. 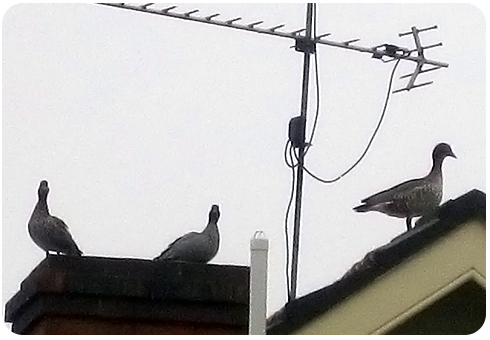 I did a double take and realised that it was three ducks sitting on the roof! They must have stopped for a rest while migrating or moving to a new area. A blurry photo as I had to use the digital zoom on my camera. Ducks! A lovely start to the day, not to mention seeing our first female PM being sworn in. Get better soon you. Love the ducks, what a great photo. Thanks Joyce! Got some probiotics / yakult type drink and am feeling much better. Yay!